The start of a Military SF series from imprint best-seller and Tom Clancy game series writer Jay Posey. Captain Lincoln Suh died on a Wednesday. And things only got harder from there. 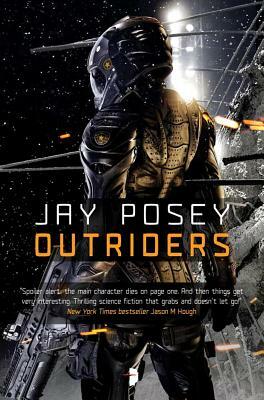 Snatched out of special operations and thrown headfirst into a secretive new unit, Lincoln finds himself as the team leader for the 519th Applied Intelligence Group, better known as the Outriders. And his first day on the job brings a mission with the highest possible stakes. Jay Posey is a narrative designer, author, and screenwriter. Currently employed as Senior Narrative Designer at Red Storm Entertainment, he's spent about 8 years writing and designing for Tom Clancy's award-winning Ghost Recon and Rainbow Six franchises. He started in the video game industry in 1998, and has been writing professionally for over a decade. A contributing author to the book Professional Techniques for Video Game Writing, Jay has lectured at conferences, colleges, and universities, on topics ranging from basic creative writing skills to advanced material specific to the video game industry. The author lives in Durham, NC.